C+L foam underlay. I used neoprene foam from C+L Finescale for the underlay. This was of 5mm thickness, although I believe they now also have an 3mm version available. The foam may at first seem rather sensitive: Even a light prod of a finger leaves a noticeable hollow. However, the foam eventually evens out, and in any case becomes much less sensitive once fixed in place. For this I used a gooey, water-based glue, normally applied to carpet underlay. I extended the foam across the entire baseboard, rather than using it only beneath the track. 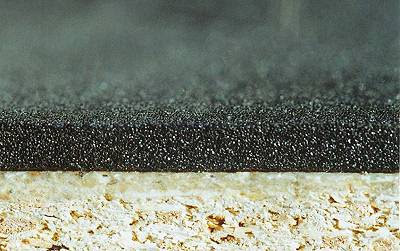 This also allows buildings and structures to be recessed into the foam by cutting appropriate holes, thereby eliminating the problem of unsightly gaps between structures and ground surface. Look at that heavy chipboard - stone age baseboards, but it was what I had lying around at the time. 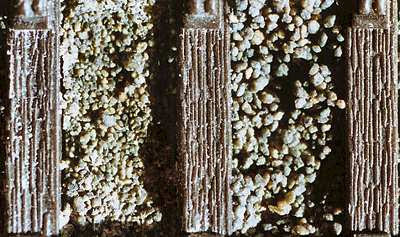 Carr's 4mm ash ballast (left) vs 2mm stone ballast (right). In Edwardian times, neat ballast shoulders were rarely seen in bay platform areas on the GWR. Photos of the Newbury bays suggest a light sprinkling of a rather fine ash-like ballast, and sleepers almost level with the surrounding ground. Since most manufacturers seem to insist on over-scale ballast, I experimented with both 2mm stone ballast and ash ballast. 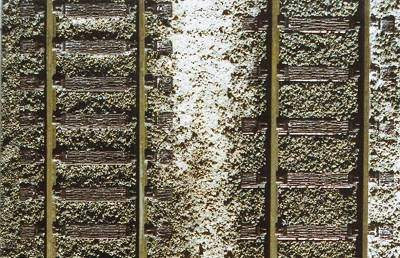 The picture above compares Carr's 4mm Ash ballast (left) with 2mm Dark Grey Ballast (right) from the same company. I opted for the finer Ash Ballast, a dark grey matter of non-stone material. This gives a nice representation of the very fine ballast I was after. 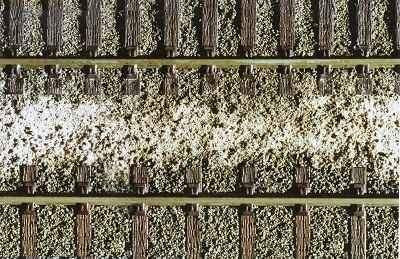 Ballasted track. I applied the ballast to the track through a film cannister, pierced with holes at the bottom to get an even and controllable spread. This was then adjusted with a fine brush and a not-so-fine index finger. I sieved away some of the finer ballast dust beforehand, and then later added it to the top in order to enhance the "fine" look. Original and extended sleeper spacing on Peco track. The track is Peco Code 100, left over from an earlier layout. I consider this a compromise, but I stuck to my principle of exploiting the items I already had available. Moreover, with careful ballasting and weathering it is a compromise I can live with. I did experiment with the sleeper spacing, to see if I might create the illusion of scale track gauge. I realize this is a very subjective thing, but for me the extended sleeper spacing gave a slight narrow gauge look with which I wasn't quite happy, so I decided to leave the track as it came.